← DID OBAMA CHANGE CUBA? HAVANA — The former guerrilla fighters who founded Cuba’s single-party government will hold power for years to come after a twice-a-decade Communist Party congress kept President Raul Castro and his hardline deputy in the top leadership positions. Fidel Castro, who held power for nearly five decades before ill health led him to make way for his brother, delivered a valedictory speech to the congress Tuesday and called on it to fight for his communist ideals despite the fact that he is nearing the end of his life. 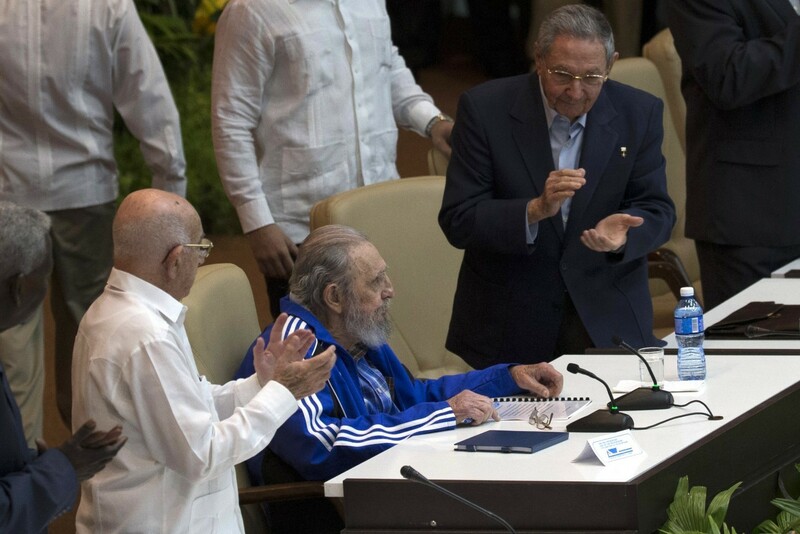 Raul Castro, 84, said he would remain the party’s first secretary and Jose Ramon Machado Ventura, 85, would hold the post of second secretary for at least part of a second five-year term. Castro currently is both president and party first secretary. The decision means he could hold a Communist Party position at least as powerful as the presidency even after he is presumably replaced by a younger president in 2018. Castro indicated that he and Machado may also step down before the next congress in 2021, saying this year’s session was the last to be led by Cuba’s revolutionary generation. Machado Ventura, who fought alongside the Castro brothers to overthrow dictator Fulgencio Batista in 1959, is known as an enforcer of Communist Party orthodoxy and voice against some of the biggest recent economic reforms. Despite the ascension of five younger party officials, including three women, to the party’s powerful 17-member Political Bureau, the day’s events disappointed many Cubans who had been hoping for bigger changes at the top of the single-party state. Fifty-five years after Fidel Castro began installing a single-party system and centrally planned economy, younger Cubans complain bitterly about low state salaries of about $25 a month that leave them struggling to afford food and other staple goods. Cuba’s creaky state-run media and cultural institutions compete with flashy foreign programming shared online and on memory drives passed hand-to-hand. Emigration to the United States and other countries has soared to one of its highest points since the revolution. Limited openings to private enterprise have stalled, and the government describes capitalism as a threat even as it appears unable to increase productivity in Cuba’s inefficient, theft-plagued networks of state-run enterprises. The ideological gulf between government and people widened last month when President Barack Obama became the first U.S. leader to visit Cuba in nearly 90 years. He gave a widely praised speech live on state television urging Cubans to forget the history of hostility between the U.S. and Cuba and move toward a new era of normal diplomatic and economic relations. This entry was posted in Blog and tagged Communist Party of Cuba, Fidel Castro, Politics, President Raul Castro, Seventh Party Congress. Bookmark the permalink.